MTV hosted Michel Aoun on Walid Abboud’s show “Bi Mawdou3iya” yesterday and he discussed the current debacle in the country regarding the electoral law and whatnot. So because we live in extremely sensitive times, Lebanon’s main political foe for Michel Aoun is, naturally, going to seek out airtime as well. Samir Geagea will be on “Bi Mawdou3iya” as well tomorrow, all to MTV’s delight. This isn’t about what both politicians want to discuss (or not discuss). It’s not about their propositions and constant tug-of-war leading nowhere. In order to announce the episode, I stumbled on the picture that follows. 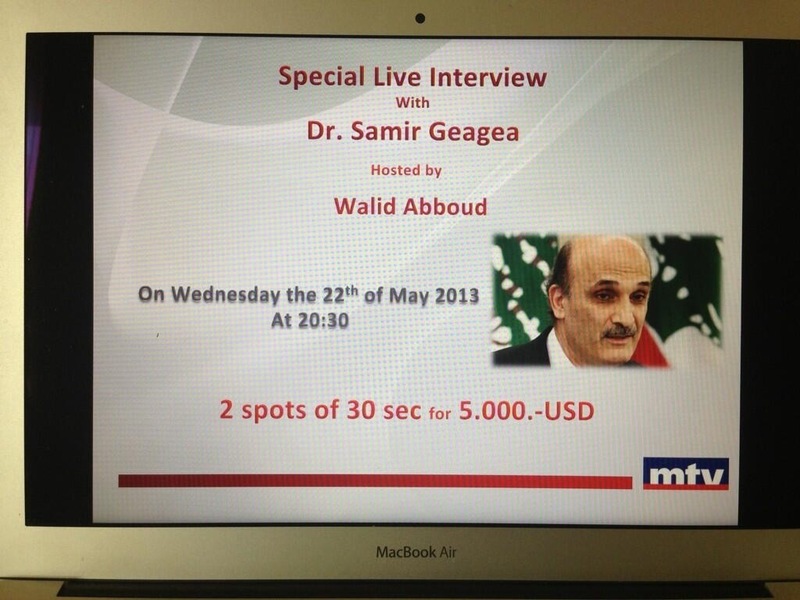 The most interesting part of the picture to me was the cost to run an ad on MTV during Samir Geagea’s show. Two 30 second ads can cost you up to $5000. Every single second of commercial break is probably sold by now. This is how much audience our politicians bring in. Too bad there’s absolutely no tangible and efficient measures that are brought with them and the income they bring to the TV stations they appear on. This entry was posted in Lebanon and tagged Ad, Lebanon, Michel Aoun, MTV, politics, Samir Geagea. Bookmark the permalink. Maybe he should quit politics and start a TV show! It is important to clarify a few things since you seem to have a few things mixed up. The media rate is planned by the media itself (in this case MTV) relative to the program and not the guest. Having said that, the program in question usually has 2 types of ad spots. the 5000$ spot (early on in the show) and the 2000$ spot by the end of the show (some might also have a 3000$ in between, depending on their rate cards). Both these guests and both parties or any other for that matter are asked to be on the show by the team of Walid Abboud, they don’t request it themselves, its the show that needs content not the other way around. They both have the benefit to be on screen of course since its a time where they have to promote their parties prior to the elections. Back to the rate cards: ANY professional in the business knows that these rates are never final since TV stations and media agencies will work their contacts to get extra media benefits like free seconds and an extra air time for a lower rate etc etc….these numbers are totally normal (you expect these during primetime broadcast on all stations). Be careful, there is a difference between unveiling conspiracies and fishing for attention. Well done on your “Oldest Church article”! how can we know how much every add cost ? 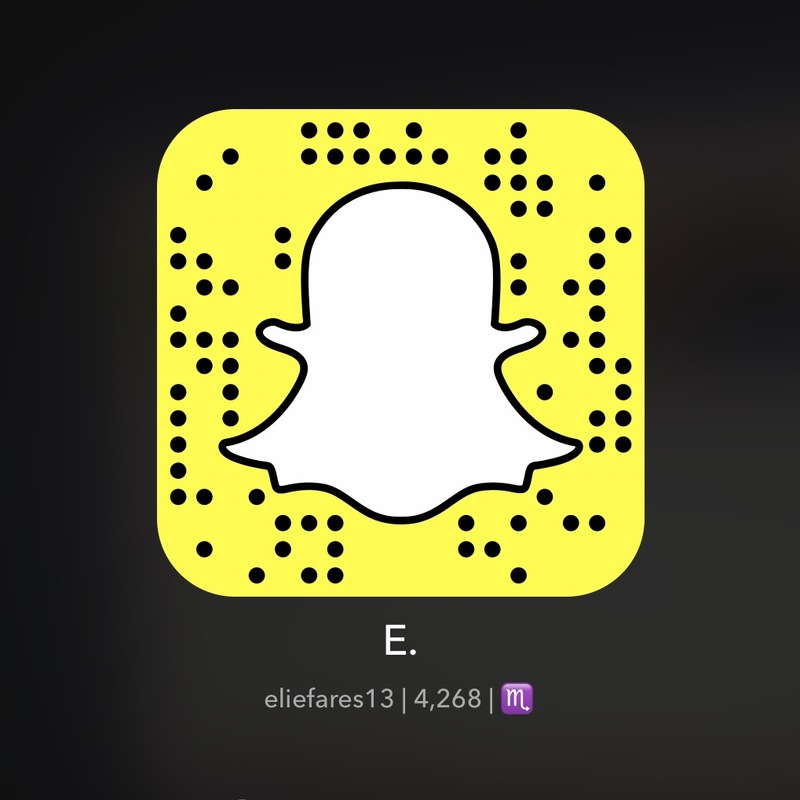 kif 3rift 2ino 5000$ per exemple ?